Linked with the articles Shirya Bhatt Mission Hospital, Jammu/India, and with ‘Of Gods, Men and Militants‘, and also with Reconciliation. Read also The Political Economy of the Kashmir Conflict. Linked also with his 3 blogs: Blog of the Shirya Bhatt Mission Hospital, the Socio-political & Cultural Blog, his Personal & Literary Blog. 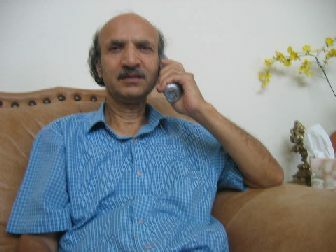 Kundan Lal Chowdhury MD – India / Kashmir. He is Advisor of our Asian-Eurasian Human Rights Forum AEHRF. He is a lifelong medical professional, practicing medicine since 1963, involved in teaching, research and humanitarian activities. • Joined Medical College, Srinagar, Kashmir (India) as a faculty member and rose to the level of Professor of Medicine. Published papers in several national and international journals. • Career as a professor of medicine cut short when forced to leave his native land of Kashmir in the wake of terrorism in 1990. The ethnic population of Kashmiri Pandits numbering more than three and a half thousand along with a few thousand of Muslims and Sikhs, was driven out from the valley of Kashmir. • Deeply affected by the alarming rise in the incidence of various diseases and the appearance of new medical syndromes in the displaced population, founded the Displaced Doctors Association, and set up the charitable Shriya Bhat Mission Hospital for community health and welfare of the displaced population. • Presently Medical Director, Shirya Bhatt Mission Hospital, Durga Nagar Jammu, India 180013. • Widely known for pioneering work on The health trauma of displaced Kashmiris . Credited with drawing worldwide attention to this tragedy. • Identified syndromes like ‘Stress Diabetes’ and ‘Psychological Syndromes in Exiled Populations’ and highlighted the adverse effects of environmental and lifestyle changes on a displaced population. • Conducted extensive surveys in the Kashmiri Pandit Diaspora and wrote about premature menopause, reduced birthrates and rising death rates in the exiles leading to population depletion. • Has written extensively on various subjects – medical and scientific, social and cultural. • Has a passion for poetry and his poems have appeared in numerous journals. 1- “Of Gods, Men and Militants” Minerva Press (India) Private. Ltd. 2000. 2- “A Thousand-Petalled garland and other poems”, Writers workshop, Calcutta, India, 2003. I begin a three blog publishing work: the Shirat Bhatt Hospital work, for social and cultural publishing, and for poetry/literary and personal writings. The displaced doctors association formed in 1991 – One year after the exodus of Kashmiris, mainly the Pandits, I formed an association of doctors who, like me, were thrown out of the valley of Kashmir. We started providing free medical consultation and medicines to the displaced population. For this we hired a premesis and paid the rent from our pockets. We sought bulk supply of samples from pharmaceutical companies. We also visited the refugee camps on a regular basis and held numerous health surveys and other programmes like holding specific disease-related camps – diabetes, hypertension, asthma, etc. from time to time. Then the Shirya Bhatt Mission Hospital was commissioned in 2001. Meanwhile many of the doctors left Jammu in search of jobs and I was left only with 7 doctors. A person donated us 150 sq. yards of land , and with some donations from community members themselves and some philanthropists we constructed the present institution, named Shriya Bhat mission Hospital in 2001. It has three rooms and a waiting space for the patients in the verandah. And it has been functioning as a polyclinic ever since. There are no admitting facilities, no lab. (Excerpt from personal notes). Kundan Lal Chowdhury was born in Srinagar, the geographical , administrative and political heart of the valley of Kashmir, a few years before India gained its independence from the British and thus grew up in an era of optimism, constructive planning and hope. His parental home in Srinagar was in a locality which is 99.9% Muslim, where his family was one of the few Hindu families. He grew up amongst Muslim childhood friends from families ranging in circumstances from poor to the well connected, the politically savvy and the financially well off. He studied in mixed, secular schools like his siblings. Prejudice was largely absent and both mother and father were accepted by all and sundry in the Muslim community as friends and advisors on a wide range of issues. One of his books: Of God, Men and Militants. As a poet Kundan Lal Chowdhury is concerned with the universal human concerns in a world dominated by big power, big money and big guns. The book must be read in a universal context of our times embracing the historical mistakes which are being repeated again as well as new problems unique to these times . The anguished cry of the oppressed and the exiled is as relevant in Africa or Europe or North America or the middle East as it is in Kashmir. It speaks both for the oppressed and the oppressor communities. For there are many in both who lament the destruction of their universe. See also this review: This book of poetry gives expression to the intense hurt, sadness, disappointment, shock and disillusionment of a whole community. Only a son of the soil like Kundan Lal Chowdhury, could provide the right voice for these emotions and thoughts. (Read this on Kashmir News Network).